Below is the 2018 season recap for the Philadelphia Eagles. The defending Super Bowl champion Philadelphia Eagles appeared to be on their way to a lost season, but they snuck into the playoffs as a wild card team and upset the Chicago Bears before losing to the New Orleans Saints in the divisional round. 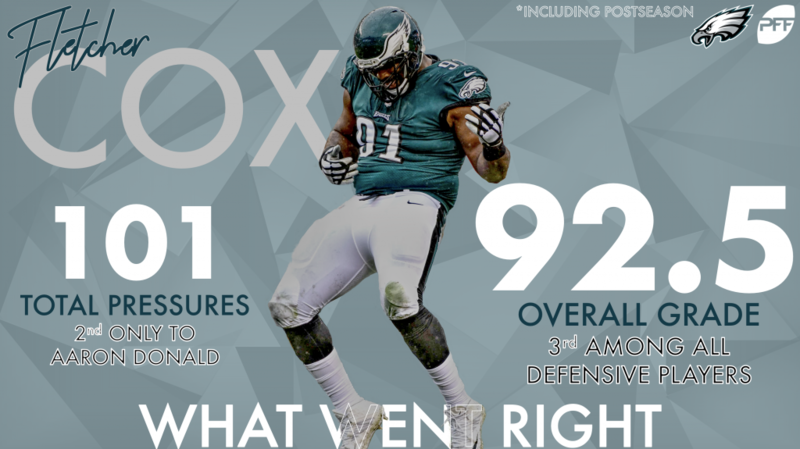 Fletcher Cox was dominant, as he was the only player other than Aaron Donald to record at least 100 pressures. His 92.5 grade ranked third among all defensive players in the NFL. 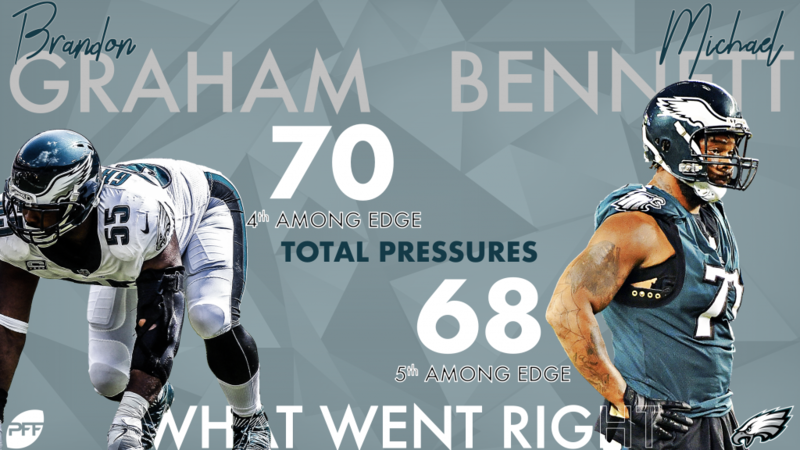 The entire defensive line got after the quarterback at a high level, as Brandon Graham ranked fourth during the regular season with 70 pressures, and Michael Bennett ranked fifth with 68. 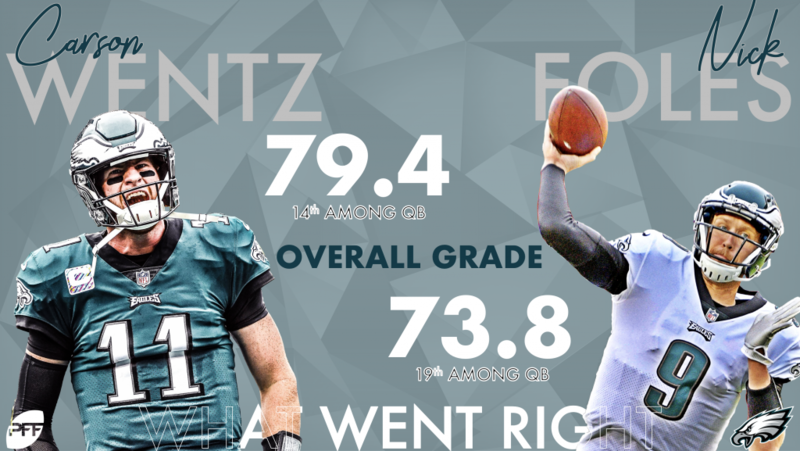 While QB Carson Wentz took a step back from 2017 with his 79.4 overall grade, he still ranked 14th among NFL quarterbacks. Nick Foles filled in admirably during the playoff run with a 73.8 overall grade. 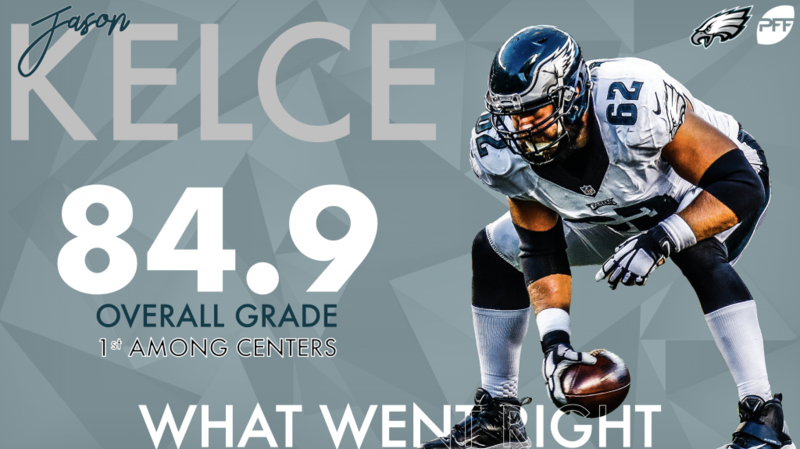 Jason Kelce was the highest-graded center for the second year in a row, finishing at 84.9 overall. Wentz was unable to finish the year for the second season in a row as injuries are now a concern for the third-year signal-caller. 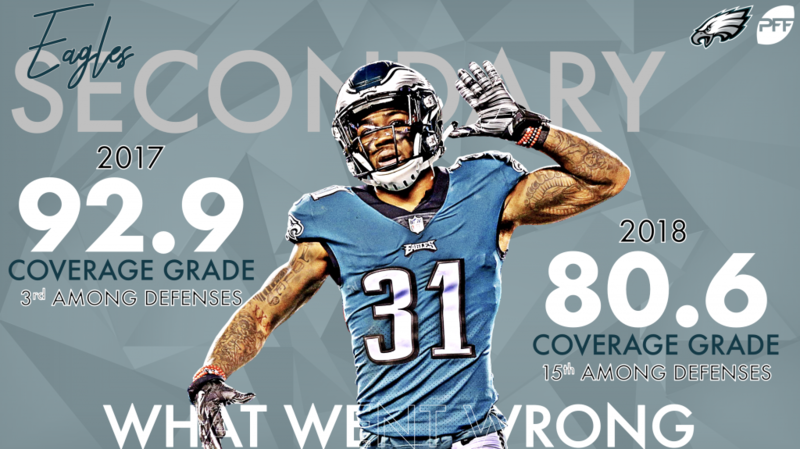 Injuries crushed the secondary, and the team coverage grade dropped from third in 2017 to 15th in 2018. Four different players allowed at least 500 yards into their primary coverage, including cornerbacks Rasul Douglas and Jalen Mills, linebacker Nigel Bradham, and safety Malcolm Jenkins. Kelce posted the top grade on the offensive side of the ball, leading all centers with an 82.9 run-blocking grade while ranking second with a pass-blocking grade of 87.7. Cox had the highest grade on the defense, finishing second in the league with 95 total pressures during the regular season, 17 more than the top edge defender. 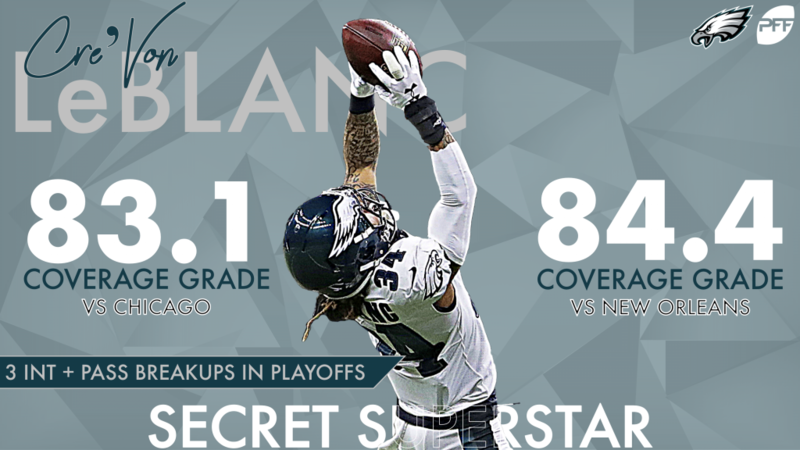 CB Cre’Von LeBlanc was an unsung hero in the two playoff games, grading at 83.1 against the Bears and 83.4 against the Saints while picking off a pass and breaking up two more. 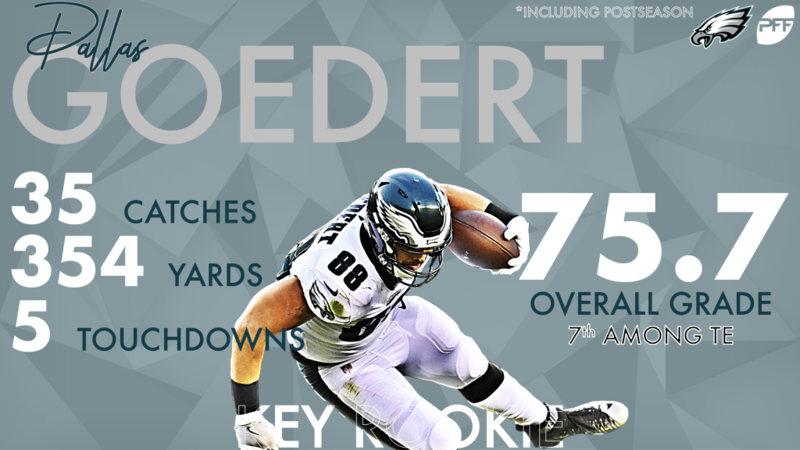 Rookie TE Dallas Goedert became a mismatch weapon on the Eagles offense, finishing with 35 catches for 354 yards and five touchdowns including the playoffs. The Eagles battled injuries to the most important positions on the field, but still made a playoff push that ended in New Orleans. They’re positioned to be right in the thick of the NFC race once again in 2019.